Hide deals from seller "Five Star Fitness"
Limit 1 per person; may purchase 3 additional as gifts. Valid on a 2-month club membership. New clients only. Not valid toward personal training or juice bar purchases. Promotional value expires 30 days after purchase. Dad helps you out in hundreds of ways, so help your dad get healthy this Father’s Day with 50% off a 2-month membership to Five Star Fitness in Joliet ($60 value). This fitness center earns its name by providing a variety of workout options in a clean, professional and fun facility. Five Star Fitness boasts a large cardio area, free weights, a basketball court and a track to keep things interesting while you’re feeling the burn. You’ll also have unlimited access to a number of yoga and group fitness classes for maximum results and enjoyment. Five Star Fitness also offers free day care for active dads. Keep your dad fit and active with this 5-star Father’s Day deal. 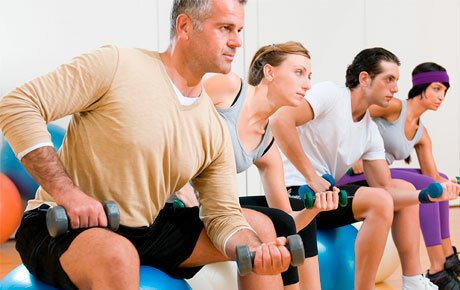 Fitness club in Joliet offering abundant gym amenities and fitness classes.